In researching the French setting for Refiner’s Fire, Book 6 of my American Patriot Series, I came across descriptions of the masked balls Queen Marie Antoinette held at Versailles. Masked balls developed in Italy from the ridotto, infamous private gambling salons in Venice, where visitors wore masks to conceal their identities. They rapidly spread throughout Europe and England and were already popular at Versailles in the mid 1770s when Queen Marie Antoinette regularly held masked balls in the Hall of Mirrors. Other royals and nobles hosted them as well at their own establishments in Paris. Extravagant costumes were de rigueur at these affairs, with popular themes being heroes and goddesses of classical antiquity; figures from the Italian commedia dell’arte; allegories representing traits such as Truth or Virtue; traditional costumes of other nations; figures from folk songs and ballads; and even animals. Part of the fun was to try guessing the identities of other masked participants, and it was traditional for everyone to unmask at the ball’s end. 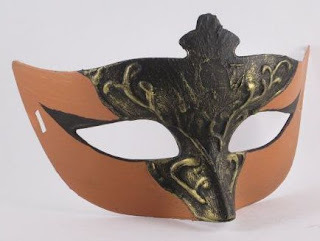 Instead of wearing a costume, some guests simply wore a domino in black or white silk over their regular formal wear, with a face mask serving as the sole disguise. But in any case everyone, both men and women, wore dominoes. The word refers to both a mask and a cloak and derives from the name of the hoods worn by French priests in the Middle Ages. The mask covers only the upper half of the face and is rounded at the corners. The cloak, which originated in Venice, was voluminous, with wide sleeves and usually a removable hood referred to as a bahoo. 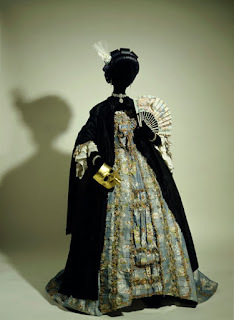 Mask and cloak were most often black but could be any color, with silk being the preferred fabric. Not only did the cloak give the wearer a dramatic appearance, but it could also accommodate the most lavish costumes. By concealing the wearer’s identity, dominos allowed one to move freely and socialize with whomever one pleased. Marie Antoinette wore the domino to attend masquerades without being easily recognized. It didn’t always work, however. Since Louis XVI rarely attended balls, one woman who happened to recognize the queen began chastising her for not acting like a proper wife and staying at home with her husband. She apparently also donned the domino for some court balls when the public was allowed to enter the gardens, which increased the number of gawkers. 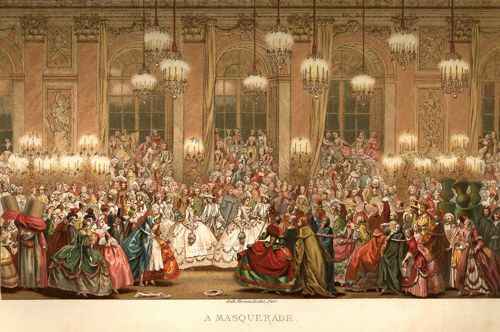 Masquerade balls were popular throughout the eighteenth century despite the disapproval of those who considered them immoral, corrupting, and even unpatriotic. These events suspended the formal conventions and norms of polite society, such as social rankings and gender roles, for a few hours. With the right costume and a mask to conceal your true identity, it was possible to step into another world in which anything became possible. The rich, famous, and even infamous danced, flirted, intrigued, and arranged assignations until dawn. And at times members of the higher ranks of the bourgeoisie were also invited as a way of introducing diversity. These wealthy commoners could otherwise never mingle with royalty and nobility, but a disguise opened up opportunities for liaisons and consequently social advancement. Critics feared that the entire social structure would be undermined if status and respect were gained or lost simply by the clothing one put on. Changes in morality at the beginning of the early 19th century led to a decline in the masquerade’s popularity. Although fancy dress balls remained fashionable in the 1800s, they became much more respectable than the dramatic, risqué masquerade balls of the 1700s. If you were to attend a masked ball, who or what would you dress as? It sure was an interesting topic to research, Connie. Thanks for stopping by! I love the idea of masquerade balls and had so much fun writing my story about a Christmas one. The one time I went to one (it wasn't really a ball, just a party) I went as a Southern Belle with hoop skirt and all. A lot of fun, but hoops were a hassle until I figured out how to sit in one. 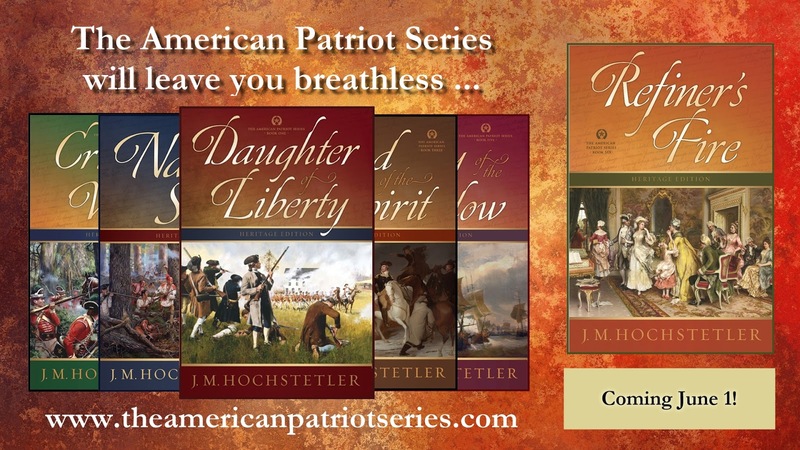 I think now I might choose to go as someone from the late 18th century like Betsy Ross. Thanks for the post. It was an interesting look at society during those times.